We are excited to announce the official launch of our brand new 9Marks Spanish website! With the help of several volunteer translators, 9Marks has translated dozens of resources into Spanish and made them available for free in one convenient, user-friendly place online. 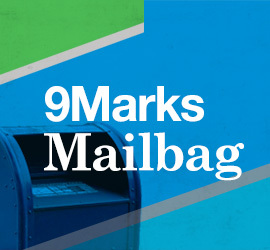 Like our English 9Marks.org website, the 9Marks Spanish website is designed to be an online resource where church leaders can find practical tools for ministry and up-to-date information about the ministry of 9Marks around the world. So what will you find on the 9Marks Spanish website? Among other resources, you will find Journals, articles, book reviews, and events—all in Spanish! Our hope is to eventually expand the site to include more 9Marks resources as we get them translated. For now, we invite you to browse the website and pass it along to friends who may find it useful. The web address for the 9Marks Spanish website is es.9Marks.org. You can also access the 9Marks Spanish website by visiting the 9Marks.org homepage and clicking on the “español” button at the top-right of the screen. We would like to extend our sincere thanks to our good friend Peter McMillan who has worked diligently to assemble a fantastic team of volunteer translators for this project. It is our joy to serve alongside Peter and many like him who have a passion to serve Spanish-speaking churches around the world. As we consider what the Lord has done, and continues to do, in Spanish-speaking countries around the world, we rejoice at God’s faithfulness and the power of his Word. And we are humbled to play even a small role in equipping Spanish-speaking saints in the work of building healthy churches that display God’s glory. We invite you to rejoice with us at this new opportunity to serve our Spanish-speaking brothers and sisters, and we ask you to pray with us that God would bring about much fruit from this new Spanish website.